There are an abundance of reasons to grow a sustainable garden indoors: rosemary chicken, basil pesto, mint tea, spicy chive dip and tarragon salmon. Due to the increase of gourmet home cooking and its partnership to fresh homegrown and local foods, there is a demand for indoor herbs. The first step to creating your own herb garden is buying or harvesting the seeds of the plants you want. There is no limit to the things you can grow in, as long as there is space underneath the compost for the water to drain out. This can be done in two direct ways: with tiny stones centered underneath the sand or by drilling or cutting holes under the preferred pot of your choice. 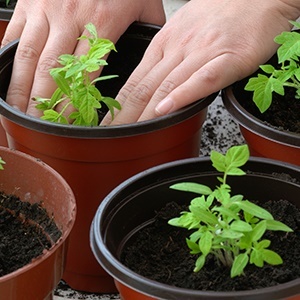 You can reuse glass jars, old teapots, vintage beakers and even old cans to start your indoor garden. Once you have planted the seeds - about a quarter up from the surface, you need to find a place in which they’ll flourish healthily. The best spot is often on the kitchen windowsill, (if it’s a south facing window) where there is enough sunlight during the day for the plant to feed off. Know what herbs you are working with to ensure they get the adequate amount of sun and water to grow properly. In order for herbs to thrive, you need to watch them carefully- from sprout to harvest. They need care and attention to give you the most of their seasoning. Clipping them regularly encourages new growth. Sometimes you’ll have a herb that you only use for two recipes and over time the branches will get really dry and yellow, so keep pruning to ensure growth. As time passes, you’ll figure out which herbs are harder to maintain and which ones you use regularly. If basil is your go-to herb and you’ve got the method down to a tee, then why not start to harvest regularly and sell at your local market? Not only will you perfect your herb skills, you’ll be able to contribute to a bountiful locally produced product in the community.